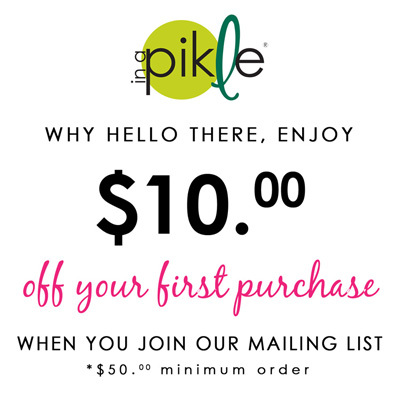 We have a 45-day satisfaction guarantee return policy on all shipments from “In A Pikle” LLC. The below policy relates to purchases made directly from “In A Pikle” LLC and not IAP Independent Distributors. It is the sole responsibility of a customer to know their distributor’s contact information and policies for any cancellations, refunds and exchanges upon purchase. “In A Pikle” recommends that customers retain the order’s invoice and review it for cancellation purposes within three (3) days of the date of purchase. For the purpose of refunds and exchanges, we recommend you review your order within thirty (30) days of purchase and contact the distributor for any adjustments. For questions please email us at customerservice@inapikle.com. If you are not completely satisfied with your purchase, you may return it within 45 days from date of purchase for a full refund, excluding shipping and handling charges. You are responsible for shipping method, handling, and fees associated with returning the product to us. Original shipping & handling charges are non-refundable. We would be happy to refund your shipping costs upon return if the item is damaged or defective. All refunds will be calculated using standard shipping rates regardless of the shipping method the customer has chosen for return. Please fill out our EXCHANGE/RETURN FORM and include it along with a copy of your original invoice. We recommend adding delivery confirmation when sending your purchase back to us, as we cannot be responsible for packages lost in the mail. Any delivery confirmation charges or added postal fees will not be refunded. You will receive a confirmation response within 24-72 business hours. We will gladly exchange any unsatisfactory item within 45 days of purchase. Exchanges are subject to current product inventory and availability. You are responsible for shipping method, handling, and fees associated with returning the product to us, but your new item(s) will be shipped to you FREE OF CHARGE (standard shipping only). Original shipping & handling charges are non-refundable. We would be happy to refund your shipping costs upon return if the item is damaged or defective. All refunds will be calculated using standard shipping rates, regardless of the shipping method the customer has chosen for return. Please fill out our EXCHANGE/RETURN FORM and include it along with a copy of your original invoice. If there is a price difference, we will charge or credit the same card you used on your initial purchase. We recommend adding on delivery confirmation when sending your purchase back to us, as we are not responsible for packages lost in the mail. Any delivery confirmation charges or added postal fees will not be refunded. Replacement items will be processed and shipped upon receipt of merchandise to be exchanged. Refunds will be issued upon receipt and inspection of merchandise to be returned. All exchanges will be shipped back to you FREE OF CHARGE (standard shipping only). Please allow 2-4 business days (upon our store receiving your package) for us to process your return or exchange. Exchanges are subject current product inventory and availability. In the unusual event that you received a damaged or defective or an incorrect shipment, Please fill out our EXCHANGE/RETURN FORM and include it along with a copy of your original invoice. We proudly stand behind all of our products, and will be more than happy to replace your item if there is a defect in your product. Please Note: “In A Pikle” does not return or exchange the small convenience items included in the “In A Pikle” Starter Pak or Refill Paks. If you need further assistance, please contact our shipping department by emailing customerservice@inapikle.com. The standard ground mail service is shipped via the United States Postal Service First Class, Priority Mail and UPS. Orders are processed and shipped with 1-4 business days after the/your order has been received. Please be advised that shipments are not sent out on Saturdays, Sundays, or any Holidays. We do not guarantee arrival dates or times.